When I first started speaking to promote my biz I made every mistake in the book. There’s a lot to keep in mind. You’re anxious to ace your presentation, give the audience a great experience, keep your host or event planner happy, and so much more. 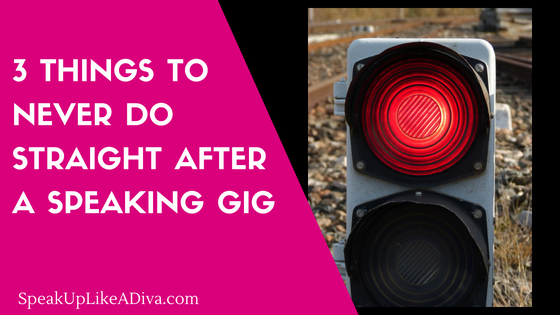 So it’s no surprise that most of us, especially the introverts, want to get outta town (or at least out of the venue) as soon as we’re done and we’re less vigilant about what we do immediately after making our presentation. 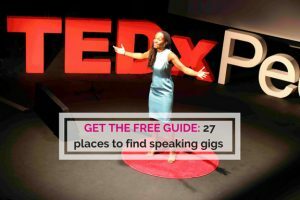 But here are three things you should avoid if you want to get the best out of your speaking gig and maximise the opportunity. Why? If you did a good job, people will be queueing up to speak with you. They’ll want to congratulate you, share a similar situation they’ve been in themselves, chat to you about potential work opportunities and more! 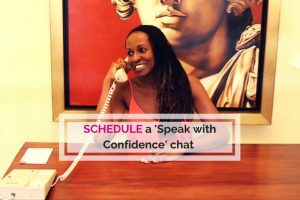 Yes, maybe you feel you deserve a glass of wine, or a lie-down in darkened room to recover from your speaking ordeal (just kidding) but plan to hang around for a while as this is when the magic happens and the opportunities come your way. When I used to sing and perform my original songs around London, I encountered the same thing. The better I connected with the audience via my music and stories, the longer the line of people waiting to chat to me after the gig. It’s human nature to want to get closer to people that have given us a good experience. Yes, if you’re making a business presentation, the audience will probably have your contact details and can get in touch later, but the moment they’re most enthusiastic is right after hearing you speak. Don’t let a hot lead go cold. Be available. Have a note book and pen, or your phone etc to hand and if someone looks like they want to get into a deep conversation with you, apologise, take their details and say you’ll be in touch. This is not the time to allow yourself to be monopolised. Perhaps the person means business or perhaps their train doesn’t leave for another hour and they’re trying to kill time by chatting to the speaker. I ran an event last year and although I spoke for free, it has since generated a good amount of new business. Great news, but I know that that particular event could have generated even more if I’d been available to speak to more of the audience straight after the event, rather than engage in conversation with one lady for 15 mins. Duh! It’s not rude to say ‘I’d love to chat with you some more so please give me your details and I’ll be in touch’. Give it a try. As much as people might want to receive your free gift or register their interest in a consultation, there’ll always be a one or two that need to rush off straight after your talk, or who can’t be bothered to wait in line. Avoid this problem by giving the audience time, during your talk, to share their contact details. That way, everyone that wants to go further can let you know and you will feel comfortable knowing you’ve captured the details of potential new connections. 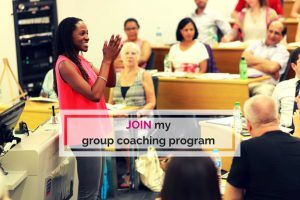 If you’re a female coach or entrepreneur and you’d like to grow your business with public speaking, please do come and join the private Facebook group. Or click the link to find out more about private coaching.